If you look hard enough as you walk down the cobblestones of London’s infamous Brick Lane, you shall stumble across an enchanted promised land most commonly known as Paradise Alley. 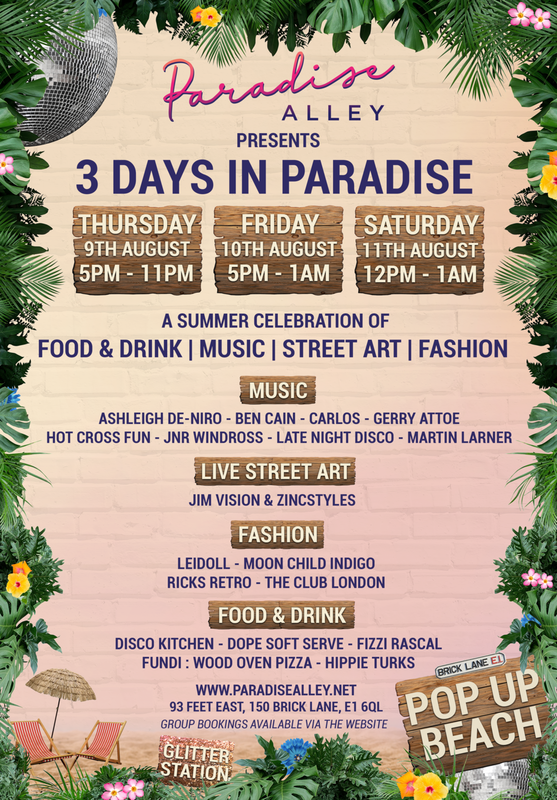 This August we’re taking things even bigger and bolder, bringing beach life to Shoreditch for not one or two, but a 3-day celebration of East London’s culture in a paradisiac landscape at 93 Feet East. Discover new foods whilst you enjoy the sun on our brand new exclusive beach area. Take time to relax as you watch street artists work their magic and indulge in exquisite ice cream flavours from the beach shack. When the sun sets we take it inside to shake those hips as our DJs take control and create that special Paradise Alley's feel-good atmosphere.